The women fell 6-1 to #1 Cornell in game two of their quarterfinal series. With the loss, RPI’s season comes to an end, while Cornell advances to the semifinals next weekend. The men could only manage a 2-2 tie against Quinnipiac tonight, which resulted in RPI finishing in the 5th spot once all the other games were complete and tiebreakers applied. 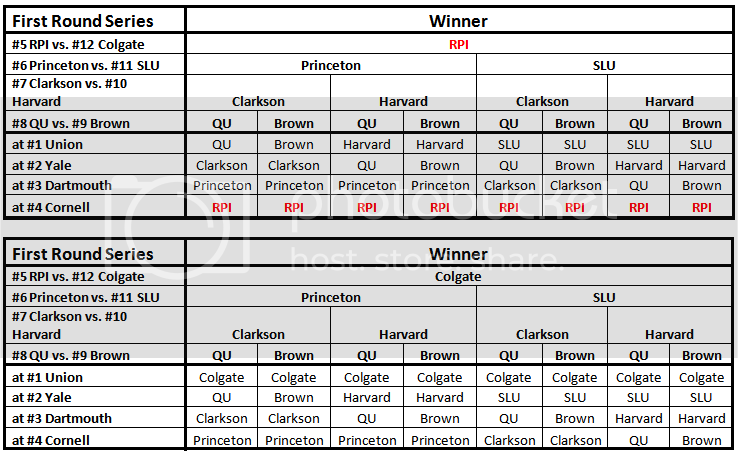 The Engineers will host Colgate next weekend – probably one of the most dangerous 12 seeds in recent history. If RPI manages to advance out of next weekend (which is by no means a given looking at Colgate’s play and RPI’s recent struggles), they are rewarded with a weekend trip to Lynah Rink to face Cornell in two weeks. Quite possibly the worst draw we could have managed. All 3 games against Colgate next weekend (Friday, Saturday, and Sunday if required) will be at 7pm. Tickets are on sale now at the Field House Box Office. This Clarkson fan (I know, whatever) would like to thank you for a great blog, and particularly for keeping track of all the playoff scenarios so elegantly. You rival USCHO for a source of clear information - even if your views are tinted red. I second what Matt said. As a Yale fan, I appreciate your overall view of the ECAC and your projections on bracketologty and the playoffs. Thanks for the comments guys - nice to know we're becoming a resource for more than just RPI fans! Do you know if they reformulate the brackets for semi-finals based on the results of the quarter-final games? The playoffs are re-seeded at every round such that the highest remaining seed will play the lowest remaining seed.